It had only been half a year since Washington, D.C. had hosted the traveling annual multi-sport tournament ALA Meistarsacīkstes. Several of us who had helped organize Meistarsacīkstes were now working on the song festival, and the memories came rushing back: All day every day for several months we had been glued to our phones, attempting (and repeatedly failing at) what should have been a simple task: booking some venues. It’s the type of thing that seems straightforward and easy until you try it; you call and ask for availability and wave some cash, the venue says yes or no, and boom, you’re booked. Simple, right? Oh no, not even close. Where event venues are concerned, nothing is ever simple. Before I go any further, I want to make clear that the organizing committee could not be more thrilled with the festival’s venues, from the grand hotels that provide impressive views of Baltimore Harbor to the intimate Baltimore Soundstage, just a six-minute walk away and host of the festival’s first party. Indeed, one of the main reasons we selected Baltimore as the host city was because we knew it has excellent theaters, arenas, clubs, hotels, churches, and restaurants, and we’re confident that you’ll agree once you experience them. But that doesn’t mean that getting all of the pieces aligned has been easy. The very first challenge regarding pinning down event venues was timing. Arguably the single greatest obstacle we’ve faced as an organizing committee has been having just 20 months to plan the entire festival. That may seem like a long time, but many venues get booked much earlier. One major theater was already reserved for a touring Broadway show. A hotel that we had visited and seemed promising as the festival’s home base got snagged by another group in the couple weeks between our first and second visits. Even earlier, when we were considering in which city to host the festival, towns like Boston were immediately scrapped due to venue unavailability (see Part 2 in this series). Ironically, the surprisingly more common timing dilemma was that venues often wouldn’t know their availability that far in advance, and we found ourselves making inquiries too early rather than too late. The issue mostly came up as we searched for locations for smaller events, like the play (Ceļā uz mājām, presented by the Latvian National Theatre Company) and smaller concerts. Baltimore has a handful of very cool little theaters, which seemed promising at first, but at the time when we approached them, most didn’t yet know their rental availability for 2017. In many cases their own company’s season needed to be set. Or construction projects got in the way. A world-renowned music conservatory with a plethora of potential stages told us to check back at the start of the school year, which we did, only to be met with: “Turns out we’re renovating. Check back in the spring.” Considering that we were hoping to start selling tickets in the fall and were budgeting for and expecting thousands of attendees, checking back was not an option. And so it continued. Each venue had a different sweet spot in terms of timeline; catching them at just the right time proved to be difficult. The second major challenge regarding pinning down venues for our shows was budget constraints. Letting our imaginations run wild and disregarding financial limitations, we explored all sorts of inventive scenarios, from a dance party among the dinosaurs of the science museum to jaundejas at the open-air pavilion on the waterfront. But these wish-list ideas ran up against one hard truth: Our largest events require seating for a couple thousand people and stage space for several hundred. This audience-performer ratio is not too common, and it most certainly does not come cheap. The only two ways we could have made these larger events break even on their own would have been to double their ticket prices (don’t worry, we wouldn’t do that to you folks) or to double our audience size (please bring friends!). And so, with the larger venues uncompromisingly eating up big chunks of the festival budget, finding affordable options for the other events so that they could help subsidize the main events was crucial. Unfortunately, the search for modestly priced smaller venues turned up less-than-ideal solutions, as nearby options (such as local high schools) failed to meet the professional standard of the event, and more appropriate options were too far away. Luckily, we were saved by two perfect sources that served as financially responsible options. First, our trusty hotels came to the rescue, offering up fantastic spaces for most of the evening events, the art and fashion exhibits, and even the theater performance. And a local Latvian led us to a hidden gem of a church so beautiful and ideal that we probably would have jammed every event into it if we could have (in the end, we went with just two concerts). Timeline and budget are obviously the main factors in venue selection, and in theory, the story should end right there. But even once you are on a venue’s calendar, things can go wrong. You can never really rest until the contract is signed and countersigned. And waiting on the finalization of the contract can be frustrating, since even in today’s modern world communication is rarely instant. Our seemingly monumental festival is small potatoes to our largest and priciest venue, and so while we got a base price estimate right away, getting a final estimate that included correct audio/video and staffing costs (which had the potential to more than quadruple our expenses) took weeks. Considering that this venue’s rent and all of its non-negotiable ancillary costs constitute the festival’s single greatest expense, we were understandably anxious to receive an estimate so that we could figure out if the rest of the festival was financially possible. It was the very epitome of catch-22 timing: we had to book right away to reserve our slot, but wouldn’t know for months whether or not we could afford it. We also needed to advertise the festival far in advance so that potential attendees would keep their busy summer schedules open, but we wouldn’t know if the festival was financially viable until after we had announced that it was taking place. Our single greatest venue-booking frustration came in June, mere weeks before hotel and flight reservations would become available: one of our venues went MIA. A major one. One that had been on the books as a safe bet from the very beginning. All that remained was to sign the contract and send our deposit. But no contract came. Several members of our team called and emailed repeatedly over a several-week period. Nothing. Radio silence. To this day, we still have not received an explanation, though we gather that, despite assurances in the winter that logistics would not be an issue, they likely backed out due to the headache of assembling choral risers with a short turnaround time. 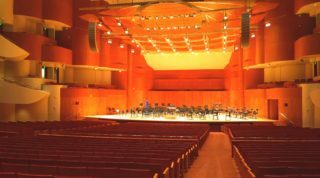 Thankfully, we found a solution when we discovered that one of the city’s most beautiful large concert halls was available — and not only available, but, as it turned out, perfect for its intended event. While some (myself included) might initially envision a doomsday scenario when such potential setbacks reveal themselves, this situation proves that, with careful attention and planning, you can find a solution or workaround for virtually anything. And now, I end with a confession: this article was originally intended to come out months ago, because we had fully expected to have all of our venues, big and small, completely finalized by the end of the summer. Alas, though we almost made it — we opened the ticket store in October– one venue-less orphan event was responsible for the delay. That event, surprisingly, was the chamber music concert. At first glance it should have been easy to procure a location: musicians can set up pretty much anywhere, right? Baltimore’s own symphony orchestra recently performed a pop-up concert at nearby Penn Station. And audience capacity shouldn’t have been an obstacle: we only needed seating for a couple hundred (instead of the couple thousand expected for larger events). 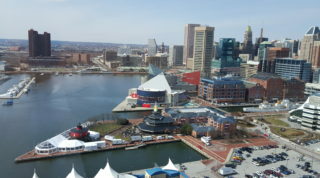 Dozens of venues in Baltimore fit the bill, but almost all had issues with scheduling or were too far from the hotels. But the real obstacle was the flīģelis (a word I’d never heard before and had to repeatedly look up because I thought our music director had pulled it from a Dr. Seuss book just to mess with me). Few places (including our otherwise-convenient church venue) have a grand piano nowadays, and there are considerable additional costs associated with bringing one in from the outside. With all traditional venues crossed off the list, our quest for a grand piano, or for a nearby space where we could afford to bring in a grand piano, forced us to look outside the box again. We fell in love with one of these unconventional spaces as soon as we saw it: a whiskey warehouse turned outsider-art gallery, the American Visionary Art Museum is walkable, affordable, and just plain cool. But could we manage the cost and logistics of bringing in a flīģelis? It turns our we didn’t need to worry about it. “Well, sure – we could probably get a grand piano up to the third floor by tilting it on its side in the elevator,” explained the rental manager, “but… we can also use the baby grand that’s already on that floor.” Sometimes providence truly saves the best for last. For full descriptions, photos, and maps of festival sites, check out the festival website’s “Event Venues” and “Location” pages. And, of course, you’ll have the opportunity to experience all these amazing venues for yourself this summer in Baltimore. “The Making of a Dziesmu Svētki” is an ongoing series documenting the behind-the-scenes process of organizing a Latvian song and dance festival. The XIV Latvian-American Song and Dance Festival will take place in Baltimore, Maryland, from June 29 to July 3, 2017. For more information, please visit www.latviansongfest2017.com or write to info@latviansongfest2017.com. If you ever want to feel like a total rock star, host a dziesmu svētki (Latvian song festival). Yes, the majority of your time leading up to the event will consist of unglamorous sweat and tears, sleepless nights poring over non-profit status applications, budget woes, marketing plans, and music selections, but for one brief moment, at the very beginning, you’ll go through one of the most ego-stroking experiences I have ever known: the hotel tour. Our tour continued to the club lounge, where my attention was captured by a roped-off display of tote bags full of Maryland-themed goodies and a beautiful array of puff pastries. “Oh yeah, that’s for you,” our guide said with a sly grin. “Our pastry chef heard you were coming and he whipped these up specially for you.” The tour concluded with complimentary lunch in the hotel restaurant. I could get used to such VIP treatment. Ultimately, we wound up choosing a different hotel – one that didn’t resort to pastry offerings and bags of swag to woo us, but instead spoke for itself. The Renaissance Harborplace Hotel fit perfectly with the Latvian song festival spirit, winning us over with genuine hospitality, practical solutions, and honest enthusiasm for our event (even the hotel’s chef excitedly offered to work with us on serving up Latvian dishes). Add to this winning recipe a prime central location and idyllic gathering areas, and we didn’t even have to think about it. Sometimes a place just feels right, and all the personalized pastries in the world cannot counter that. On a larger scale, I feel the same way about about Baltimore assuming the role of host city for next summer’s XIV Latvian-American Song and Dance Festival. Baltimore is genuine. Those of us who have experienced what it has to offer love it. And we have full confidence that everyone else will love it too. We just need people to get there. Actually, no, there isn’t. We checked. As mentioned in the previous entry of this series, finding an ideal location for a song festival is difficult, due in part to the scarcity of appropriate, available venues, particularly for the folk-dancing show. We began by considering major East Coast cities with sizable Latvian populations. New York was expensive. Philadelphia’s venues were in undesirable areas. Boston’s hoped-for venues were already booked. Even Charleston, South Carolina, was briefly considered due to intel from a Latvian familiar with the venues there, but it was just too far from any other organizers (maybe next time?). From the very beginning, Washington, D.C., the home of most of the organizing committee, was in the lead, but hanging on by a thread: it had a million factors working against it, including possible hotel overcrowding due to the Independence Day holiday (the busiest weekend for the nation’s capital), tiny hotel ballrooms that would require evening events to be held in astronomically expensive outside venues, and a folk-dancing arena with virtually no backstage area and relatively limited seating. In essence, a D.C. festival would have no room for error, and would only work if barely anyone showed up – an utter dream for a committee of first-timers hell-bent on ensuring the future of the Latvian American song festival tradition. It’s not clear exactly how Baltimore took root as a serious candidate, but I do remember the first time I heard the idea. It was shared in passing years ago by my friend Inga Bebris when we were kids. “If D.C. ever hosts, we should do it in Baltimore,” she said. “Just think about it – everything we would need is right there in the Inner Harbor. And at a fraction of the price of D.C.” it turns out Inga might be psychic, because roughly a decade later she was serving as the ticket coordinator for a song-festival organizing committee that was rapidly reaching the same conclusion she had reached years ago. As we moved into the new year and our city selection process gained steam, the reasons to pick Baltimore piled up. Local institutions were welcoming, from the chamber of commerce to hotels and venues (which, most importantly, were available on the dates we were eyeing). Most potential festival locations were within walking distance, and non-walkers could easily catch the Charm City Circulator tourist bus for a convenient free ride to the show. The area was full of family-friendly things to do between performances, from the astonishing National Aquarium to the historic home of the Star Spangled Banner, Fort McHenry. Food options were virtually limitless, from quality quick bites like Noodles & Company and Chick-fil-A for dancers on the go, to Maryland’s signature Chesapeake Bay crab cakes, available at legendary Phillips Seafood. The icing on the cake was BWI airport: ranked one of the world’s best airports and connected to the Inner Harbor by a quick and easy Light Rail ride, it was also the second-least-expensive major airport in America, a sure-to-be welcome bit of news for folks looking to fly in from the Midwest and West Coast. Some people were still pulling for a D.C. plan to work out, but to many of us locals, the choice was obvious. 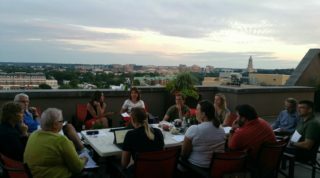 This point was made abundantly clear one day in late January, when a couple of us sat down with a handful of leaders from the D.C. Latvian community. We carefully laid out the pros and cons of both D.C. and Baltimore. When we asked the group which city they thought we should go with, some looked back at us like we had two heads. “Baltimore, obviously. Why are we even discussing this?” they responded. But what of the opinion poll suggesting non-locals would prefer to come to D.C.? These concerns were quickly waved off with eye rolls, an affirmation that Baltimore is no difference than any other major U.S. city, and a baseball movie reference: if you build it, they will come. A couple weeks later, on the very same day that we gazed down from the swanky VIP penthouse suite while munching on gourmet treats, one of the festival’s out-of-town organizers described the reaction of some Latvians in her own community when she enthusiastically told them about the upcoming festival. Her interaction had fared very differently than our meeting with the D.C. elders. “Where?” they had all immediately asked with excitement. But at the mention of Baltimore, their faces had instantly frozen, then dropped. “I guess that’s where we’ll go, then.” While it was a good sign that they still planned to attend, the lack of enthusiasm was less than ideal. I asked the storyteller and first-time Baltimore visitor how we could best convince skeptics to make the journey and to thus experience what she was experiencing. “Pictures! Lots of pictures,” she answered immediately. She gushed at how pleasantly surprised she was by the city’s beauty and vibrance. If people could see everything that Baltimore had to offer, they would get excited and be driven to visit as well. With this in mind, we created an entire section of the festival website devoted to Baltimore’s transportation, neighborhoods, and attractions, complete with photos. We included a rotating collection of Baltimore fun facts on the home page (for example, did you know that the popular Food Network show Ace of Cakes was filmed in Baltimore, and that its starring bakery is still in operation and open to visitors?). And last month organizing committee member Aija Moeller made us of our inaugural Facebook LiveVideo post to give folks a brief walking tour of the Inner Harbor area surrounding the festival hotel. We committed so wholeheartedly to Baltimore promoting that one organizing committee member asked whether we were organizing a song festival or a Baltimore festival. Still, during several months of an active website, very few people had ventured to the “Location” section of the festival website, leaving us to wonder whether Field of Dreams may have been wrong: if you build it, but they haven’t seen the promotional photos, will they really come? We got our answer this past week, when reservations became available for the festival hotel. It was our first opportunity to get a sense of potential attendance and enthusiasm. It turned out that reservations poured in faster than any of us could have imagined, and we found ourselves badgering the hotel to continually add more and more rooms to our block. I guess our worries about Baltimore’s rep had been unwarranted, if for no other reason than that Latvians’ energetic love of song and dance outweighs all other concerns. We’re glad that you all are excited about the song festival, but I also strongly believe that, once you’ve been here, you will be excited about the Baltimore festival as well. Seeya in Baltimore! Every single day, at almost every single hour, members of the Baltimore Dziesmu Svētki (Latvian Song Festival) organizing committee are hard at work on any one of various issues, concentrating on the website or the budget, the ticket sales or the schedule, the fundraising or the marketing. Online discussions are just as round-the-clock, and address every possible detail such as logo and poster designs, appropriate English translations, ways to appeal to various demographics, and plans to shake the mistaken public perception that Baltimore is just one big episode of The Wire. Each and every decision, every puzzle piece, no matter how seemingly small, has an entire story behind it. And we’ll attempt to address each of these stories in turn. This is the first in a series of articles intended to bring you behind-the-scenes while we spend the next fourteen months putting together one of the largest and most iconic events in Latvian-American society. But for now, the basics. The sobering truth is that, up until a couple of months ago, it didn’t look like there was going to even be a festival at all in 2017, with no cities volunteering to host the event. This void would create the second-ever gap in a sixty-five year chain of Latvian-American Dziesmu Svētki, which have been held every five years since the influx of Latvian refugees post WWII. Why the hesitance? It should come as no surprise to anyone who has ever attended a Dziesmu Svētki that organizing the event is a risky and exhausting endeavor. First, the event traditionally requires a full team of talented experts, all living within a single metropolitan area. With the active Latvian-American population experiencing a natural drop-off overall, it is not surprising that finding individual cities with appropriate personnel is also becoming gradually more difficult. Dziesmu Svētki also requires an extensive list of very specific performance venues, most of which come at a high price tag. The waning numbers of active Latvian-Americans equates to a steady drop in ticket sales over the years (1962 saw 10,000 spectators, by 1988 it was 5,000, and most recently in 2013 it was under 2,000), which in turn makes venue selection even trickier. There are virtually no venues that will accommodate both the large number of performers, and the ever-shrinking audience size, while still breaking even. A solid crew and acceptable venues are the bare minimum requirements, but most Dziesmu Svētki hosts also know that festival attendees appreciate the convenience of having all festival settings within easy walking distance, the luxury of staying in a nice hotel, and the appeal of having a vibrant city to tour while in town. Between the unique human resource and venue restrictions, the expectation for an idyllic location, and the financial risk involved, it is no wonder that nobody was champing at the bit to host. Marisa Gudrā, a Boston native and Washington, D.C. transplant who would eventually become the chair of our organizing committee, listened with contemplative consternation as members of the American Latvian Association board discussed these obstacles at their quarterly meeting in September. Gudrā was pursuing an advanced degree in arts management with a concentration in programming and project management in the arts, with the intention to someday eventually be involved in Dziesmu Svētki planning. Was someday already here? As if by providence, she soon thereafter received a random text message from friend and D.C. native Nik Timrots, who would eventually become the vice-chair of our organizing committee, suggesting that D.C. should host Dziesmu Svētki. Timrots was coming down from a music and danced-induced high after participating in the 2015 west coast festival in San Jose. “I realized that the 2015 Svētki were the last ones until Rīga 2018 (and the last in North America until 2019! ), and I also realized I couldn’t wait that long,” Timrots explained. Realizing that there was a gap in 2017 that could be filled by any American city, he thought, “Why not us? Someone has to do it.” The two partnered up and began researching plausibility, unsure of whether much would come of their planning. The linchpin arrived when they received word that Latvia’s Ministry of Culture was offering grant money for cultural events in the diaspora, and that the lengthy, involved application deadline was only a few days away. “It was sort of a sign and an immediate motivation for action,” Gudrā explained to me. If something really did come of their research, then they did not want to regret not having applied. The grant application made the dream of a 2017 Dziesmu Svētki suddenly seem more attainable, and it was time to start building a team. 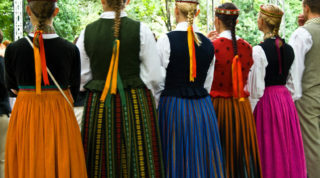 In early November, Gudrā and Timrots called together a small group of friends, all fellow members or former members of D.C. Latvian folk dancing troupe “Namejs,” for an informal meeting at local pizza joint Lost Dog Cafe, to present their proposed plans for hosting. I admit that I arrived skeptical, aware of the aforementioned challenges and the fact that our city had neither the personnel nor the venues, and that even if it did, competing with the throngs of D.C. tourists over the preferred date of 4th of July Weekend would be impossible . But Gudrā and Timrots proposed solutions to all of these initial hurdles: first, we would expand the organizing body to include specialists from the entire east coast (and beyond if necessary), starting with Boston’s choir director Krisīte Skare and Philadelphia’s folk dancing troupe leader Astrīda Liziņa to lead up the music and folk dance programs. Expanding our focus to the entire east coast meant that we considered multiple cities up and down the east coast, beginning with those with Latvian centers, but also examining others. One city stood out as the obvious choice: our beloved neighbor, Baltimore, Maryland, which shares a metropolitan area with D.C. The city has everything we need, from a top-rated and affordable airport, to a beautiful waterfront setting in the Inner Harbor, to easily-walkable and beautiful venues, all of which will be detailed in future installments. With this foundation laid, we have continued wading into the depths of Dziesmu Svētku planning. It is an involved and nuanced process, some elements of which are less obvious than others. The Baltimore organizing committee has two main resources for sorting through these elements: one, our own experiences as previous festival participants, which will come into play more than one might think, and two, tremendous support and guidance from the organizers of various previous festivals, who provide the closest thing that we have to a guidebook. Over the next several months we invite you along on this life-engulfing journey as we learn the ins-and-outs of what it takes to run a (hopefully successful) Dziesmu Svētki. “The Making of a Dziesmu Svētki” will be an ongoing series documenting the behind-the-scenes process of organizing a Latvian Song and Dance Festival. The XIV Latvian-American Song and Dance Festival will take place in Baltimore, Maryland, from June 29th – July 3rd, 2017. For more information, please visit www.latviansongfest2017.com or write to info@latviansongfest2017.com.